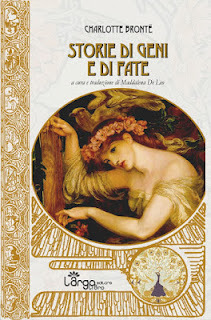 The ArgoLibro publishing company presents, translated into Italian for the first time, the following tales: An Adventure, The Pursuit of Happiness and The Adventures of Ernest Alembert, written by Charlotte Brontë when she was a teenager. The translator, Professor Maddalena De Leo, took care of every detail of the publication, which has parallel English and Italian text. We are at the beginning of a special five-year period for the Brontë family, for various occasions, including in 2016 the bicentenary of the birth of Charlotte, born on 21 April 1816 in Thornton, even if she lived in Haworth in Yorkshire. Maddalena De Leo is a scholar particularly suitable for the care of this publication. A member of the Brontë Society since 1975, she is the representative of the Italian Section as well as editorial consultant for Italy for the literary magazine Brontë Studies. Leafing through this book, we will enjoy the fascinating world constructed in the imagination of Charlotte, Emily, Anne and their brother Branwell, with the Young Men as protagonists, that’s to say the twelve soldiers given away a few years earlier by their father. It is definitely amazing, as pointed out by the same curator, that the mind of a fourteen year old could have imagined adventures so complex and rich in detail. "Why exactly do the Brontë sisters... continue to fascinate us?" The title is from an interesting article by Sarah Hughes in yesterday's Guardian/Observer which brings together information on "a slew of events that highlight the sisters' appeal to all ages". It mentions the Charlotte Great and Small exhibition at the Parsonage, refers very briefly to Ted Hughes and Sylvia Plath (see the extract below) , and anticipates the two hour drama To Walk Invisible by Sally (Happy Valley) Wainwright which will focus on the Brontës' lives between 1845 and 1848. This will be on UK television in the autumn. Certainly it’s true that there’s something almost mythical about the Brontë creation story, the idea of these three isolated young women writing so desperately that the words were almost flung on to the page. Ted Hughes called them the “three weird sisters”, intentionally summoning Macbeth’s blasted heath to Haworth parsonage. To his wife Sylvia Plath, who paid homage in a poem named Wuthering Heights, they “wrote … in a house redolent with ghosts”.